Baker & Taylor's Axis 360 platform is one of the lesser known library ebook providers. Launched in 2011, it originally supplied ebooks in Blio format before giving up and offering Epub ebooks which could be read in the Axis 360 apps for Android or iOS, or on a compatible ereader. 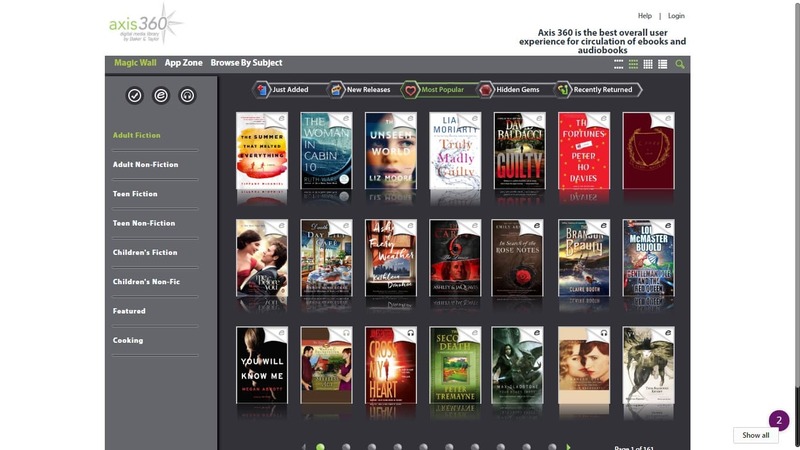 With the Axis 360 Browser Reader, public and school libraries can utilize web-access terminals as ebook reading stations so library patrons do not need to bring their own devices to read ebooks at the library. Patrons will be able to read on a personal laptop or computer, instantly, or store ebooks for later using the offline access functionality. Additionally, the browser reader comprises enhanced reading and annotation features, including a font and contrast control, reference lookups through Google, Wikipedia and the American Heritage Dictionary online, text highlighting, bookmarking and note-taking. The Browser Reader has yet to be integrated with the existing apps. So if a reader starts a book in the Axis 360 iOS app, they cannot continue it in the Browser Reader. While it is good to see Follett continue to invest in this platform after acquiring B&T in April 2016, Axis 360 still has a ways to go to catch up with OverDrive.